I have a friend of mine who delights in reminding the world how many shopping days are left until Christmas. Do you have any friends like this? I come to find you either love ’em or hate ’em. Either way, we are reminded that the holidays are fast approaching with lists to be made, money to budget, and shopping to be done. Has this ever happened to you? 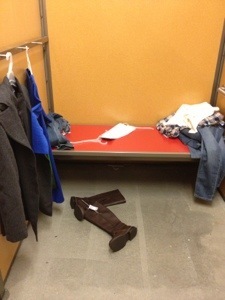 You enter a fitting room, only to discover piles of clothing discarded by someone else. What a mess! Ugh! I am discovering this is becoming more and more common to find, despite the hanging racks displayed outside the doors with signs screaming, “PLACE UNWANTED CLOTHING HERE! !” Who is going to clean up this mess? Well, the sales associate, of course. That’s what they get paid for, right? Actually, no. 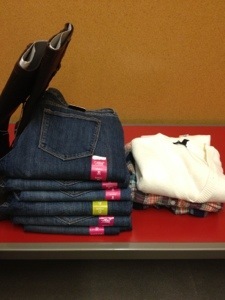 It is not the sales associate’s job to clean up my mess (or in this case, the mess of the gal before me.) Years ago, before I became a teacher, I was an assistant manager of a European clothing store. I can still recall the irritation I would feel at the end of an 8 hour shift (standing the entire time, minus a 30 minute lunch break) when I would check the fitting rooms one last time only to discover a mountain of clothing needing to be returned to the racks before closing. How exhausting! Why are people so rude? Can they not read the signs? Is it really THAT difficult to put a shirt back on the hanger again? How much energy does it REALLY take to pick up the clothes and lay them neatly on the folding station by the handing racks? Although my days working retail are long gone, rest assured that I fold and put away the same amount of clothes on a weekly basis being the mom of three kids. There are some weeks where I feel like that’s ALL I do! So when I actually carve out a little time for myself to go shopping, the very LAST thing I want to see is a pile of clothing staring back at me inside a fitting room! Usually I just ignore the pile and go about my own business of trying on clothes. After all, it’s not MY issue that someone else is rude and lazy. But who gets the short end of this stick every time? The sales associate. Which isn’t really fair either. So today when I saw this pile of discarded clothes I knew exactly what to do: show a little bit of kindness to a stranger. 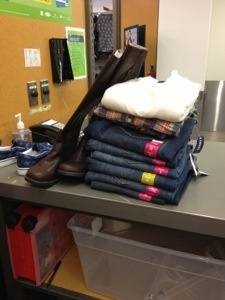 So I picked up boots and folded jeans and shirts. 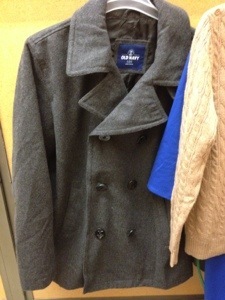 I buttoned coats and hung sweaters and dresses. 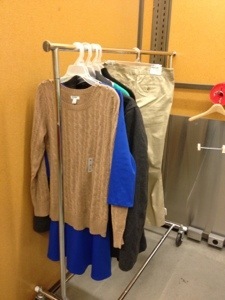 Then I placed the hanging items on the rack outside the fitting room door. This random act of kindness took exactly 4 minutes out of my day. It wasn’t hard and it didn’t cost me a dime. I even had time to try on that cute little dress, but it was too big, so I ended up not buying it. However, I bet you can guess what I did next… I took the time to hang the dress back on its hanger (even wrapped the belt around it just like it was when I pulled it off the rack!) And though I left the store empty-handed, my heart was filled with joy knowing I had done something nice for someone else without any expectation in return. Sometimes just being kind is reward enough! Have a wonderful weekend, dear friends, and as you begin your holiday shopping, be on the lookout for opportunities to bless those around you. You might be surprised how good it makes you feel!